We love everything about the Arts and Industrial Estate – its home to some of Byrons most creative and innovative businesses – and that’s why you can find Habitat in the heart of it. Here we’ve put together a shortlist of just some of our favourite neighbours which are worth getting to know. There are plenty of surf shops around (hello, this is “Australia’s surfing capital”) but McTavish Surfboards showroom and factory is a unique destination, complete with spacious café where you can truly immerse yourself in surf culture. This is the surfers equivalent to the art gallery, where professional and amateur surfers can froth over the beautifully handcrafted surfboards, signature apparel and an array of accessories. As the name implies, Comma stands for taking a moment to breathe and begin again – and after a holistic massage experience here, you’ll wonder how you ever managed without it. Not just any massage studio, this is a collaborative space and an expression of the local community – quintessentially relaxing, bringing together natural and all-Australian interiors. Designed so you can take a moment for yourself – no phones, no distractions, just you. Trust us, you will walk out of Comma feeling realigned and rewired. While you can shop Byron’s most creative fashion and homewares brands at Habitat Woman and Habitat Home, we just can’t go past the uber chic showroom of Yoli & Otis. Find everything from baby carriers, womanswear, childrenswear and accessories including blankets and shoes, along with a designer range from well-known brands such as IN BED and PAMPA. Why we love them so? All products are made from recycled materials. Their carriers and accessories use organic textiles and plant and herb fabric dyes – protecting the environment, our farmers and your children. Circus Arts Byron Bay is the place for the kids and kids at heart. Whether it’s during the school term or school holidays, a comprehensive timetable of activities is on offer including full and half day circus programs, flying trapeze, free balloon twisting workshops, indoor climbing and kids play space, giving little ones an outlet to release that extra energy. 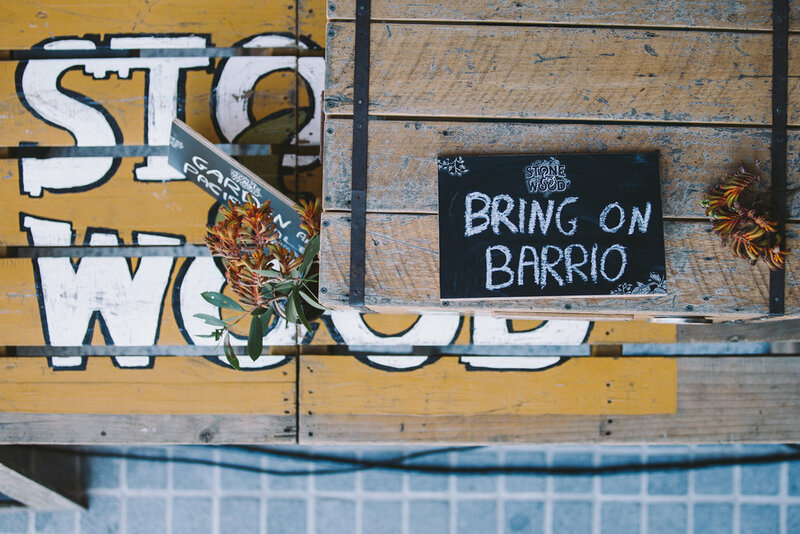 Possibly Byron’s worst kept secret is its passion for independent and local brewery Stone & Wood – for good reason too. Is there anything better than a hard-earned pacific ale following that dip in the ocean or a long, windy hinterland drive? We’ll soon wave goodbye to the birthplace of this much-loved beer from the Arts and Industrial Estate but thank goodness they’re only moving down Ewingsdale Road. Soon you can catch up with friends at the brewery’s brand new state-of-the-art brewing facility and tasting room, hurrah!